This project will keep your workshop comfy this winter—and all year round. As the weather cools, it’s the perfect time to gird your garage against the colder temperatures on the way, especially if you’ve got your home workshop in there. Metal garage doors block strong winds but do little to maintain a comfortable temperature. But if you’re not ready to plunk down upwards of a thousand dollars for a new, pre-insulated model, consider gearing up the garage door you’ve got. We’ve assembled all the info you need to understand how to insulate a garage door successfully, plus tips to help you get maximum benefit out of the project. What Can I Expect from Insulating My Garage Door? Adding insulation to the door’s interior channels can help keep your garage an average of 10 to 12 degrees warmer in winter and as much as 20 degrees cooler in summer. Insulation also reduces noise transfer, so not only will you avoid hearing street traffic when in your workshop, you’ll spare your neighbors the sounds of your son’s rock band practice. The simplest way to insulate a garage door is with a kit containing either vinyl- or foil-faced batts or foil-faced rigid foam boards. Kits start around $50, and as they increase in price often offer a more complete set of supplies—adhesive, tape, a utility knife, gloves, and perhaps even a dust mask—than just the insulating materials. The prime benefit of a kit, however, is its specially designed retainer pins. Made of lightweight plastic or metal, the pins have plates attached that adhere to the back of the garage door channels to help anchor rigid foam or batts in place. This stabilizes the insulation, so it won’t fall on your car when the door is open. 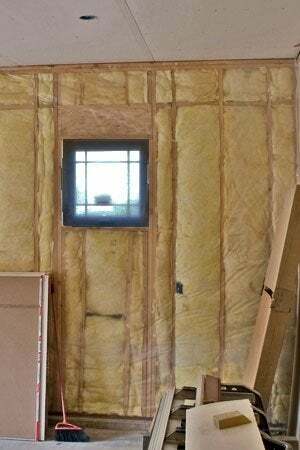 If you opt against a kit, you can use other methods to hold the insulation in place. Skipping the kit? Most DIY-ers opt for foil-faced rigid foam board panels that you measure and cut with a sharp utility knife or table saw to fit the channels inside your garage door. • The main types of foam board are expanded polystyrene (EPS), extruded polystyrene (XPS), and polyisocyanurate (called “polyiso” or simply “iso”). Any of these are acceptable for garage door insulation as long as they are foil-faced and fire-rated. Do not use non-faced foam board, which is flammable and will produce dangerous fumes if it burns; in fact, using it might very well violate your local building codes. • Choose foam board slightly thinner than the thickness of you door’s interior channel enclosures. For example, a standard garage door channel is about 1-¾ inches deep, so you would want to cut pieces from a 1-½-inch thick foam board. 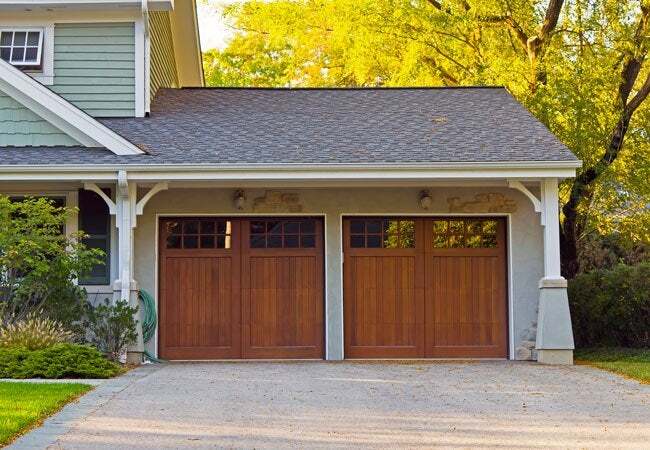 • Although they can vary, most garage door channels have “lips” that hold the boards in the channels, but rigid foam boards can still rattle around a bit if they don’t fit snugly. A bit of foam-safe adhesive, applied to the back of the garage door channel before inserting a board, will help hold it in place. You can use expanding foam to seal gaps around the sides if necessary, but a little goes a long way. Check the label of any adhesive and expanding foam spray to ensure compatibility with the foam board you’re using—some adhesive will melt foam board. While standard batt insulation is readily available—you might even have an extra roll laying around—and it’s often slightly cheaper than foam board, it’s probably not the best choice for garage door insulation if you’re not using a kit. The thinnest standard batt, at 3-½ inches thick, is too thick for most garage door channels, and compressing the batts greatly reduces their ability to insulate a garage door. If you’re set on batt insulation, find thinner, 1-½-inch thick foil-faced batting—the kind used for wrapping HVAC ducts at plumbing supply stores or order it online (do-it-yourself centers don’t often carry it). To hold the batts in place, you’ll also need to use the correct adhesive and tape recommended by the batting manufacturer. To make the most of your garage door insulation project, replace the rubber sweep on the bottom of the door. Also install weather stripping around the sides of the garage door to prevent icy drafts from blowing in. And while insulating the doors is a great first step, you’ll enjoy more heat-retention if the rest of your garage is insulated as well—heat can still escape through a non-insulated roof or sidewalls. But whatever steps you take before Old Man Winter comes calling will keep you toastier inside your workshop. But we warn you: You’ll have no excuses not get things done in there!